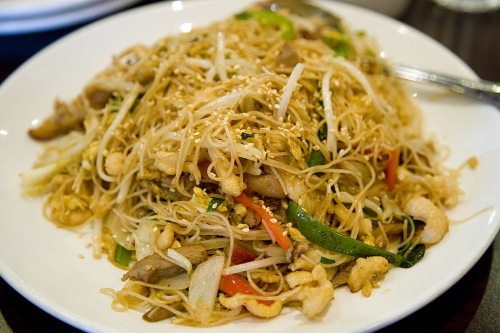 Rice noodles – one of the main components of Oriental cuisine. Noodle has a unique taste and use. It contains a huge amount of nutrients and fiber. Many cooks find that rice noodles are a great side dish for any meal. She is a great addition to salad and soup, satisfies hunger quickly. There are many recipes of cooking with the addition of funchoza. Try to prepare rice noodles at home, this is undoubtedly a very interesting and fast. To prepare rice noodles at home, you will need rice flour, which you can prepare at home. Pour in a bowl the rice, rinse thoroughly and leave to dry. Pour rice in blender and grind to the required uniform grinding. Take 0.5 kg of rice flour, pour in a bowl for kneading the dough. To do in the middle of the rice flour a small indentation. Pour into the hole 3 eggs and add a pinch of salt and gently begin to knead the dough. Remove the dough from the dish and carefully knead on a hard surface until smooth. Leave the dough to rise for 20 minutes, pre-cover with a pouch or a clean towel. Now you can start rolling. The dough should roll very thin, so it turned almost transparent. Leave the rolled out layer of dough on the table to dry for 20-30 minutes. Roll the dough into a thin tube and cut with a sharp knife into very thin strips. After this the strips of dough to expand, they would be very long. Leave the rice noodles on the table to dry until completely dry. Rice noodles are ready now you can start making delicious dishes.